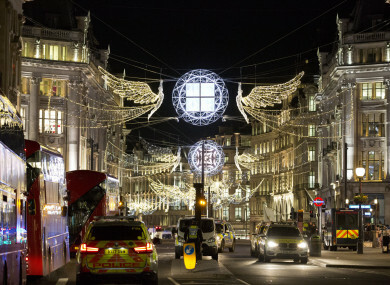 The scene in Oxford Street in London after police responded on Friday. TWO MEN SUSPECTED of involvement in a fight that sparked a terror scare in London’s Oxford Street shopping district have been questioned by police but released without charges. The British Transport Police later said they believed it all began with an “altercation between two men” on the platform of the underground station, issuing CCTV image of the pair. Oxford Circus, the junction of London’s Oxford Street and Regent Street, is one of the busiest areas in London, and was packed with shoppers seeking bargains on “Black Friday”. Email “Oxford Circus alert: Two men suspected of punch-up that sparked panic are released”. Feedback on “Oxford Circus alert: Two men suspected of punch-up that sparked panic are released”.